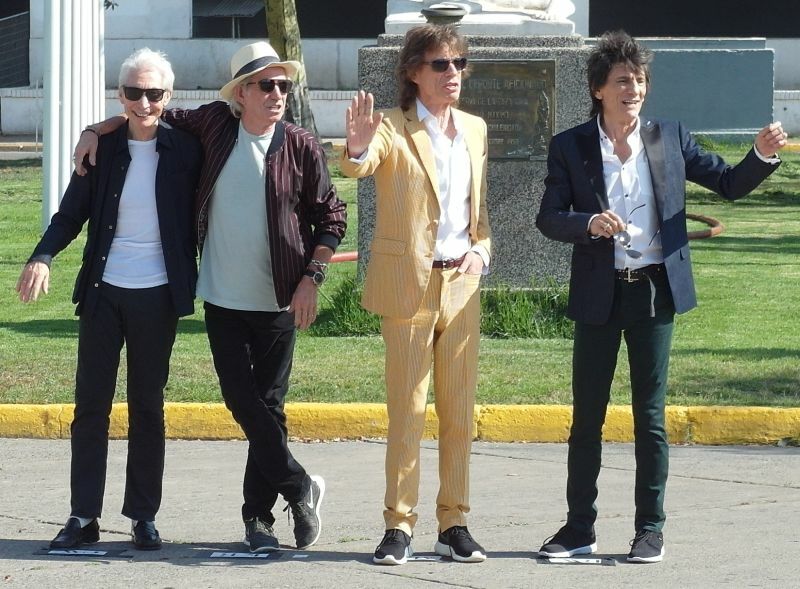 The Rolling Stones did their first public appearance in Chile in 21 years on Monday February 1, 2016. 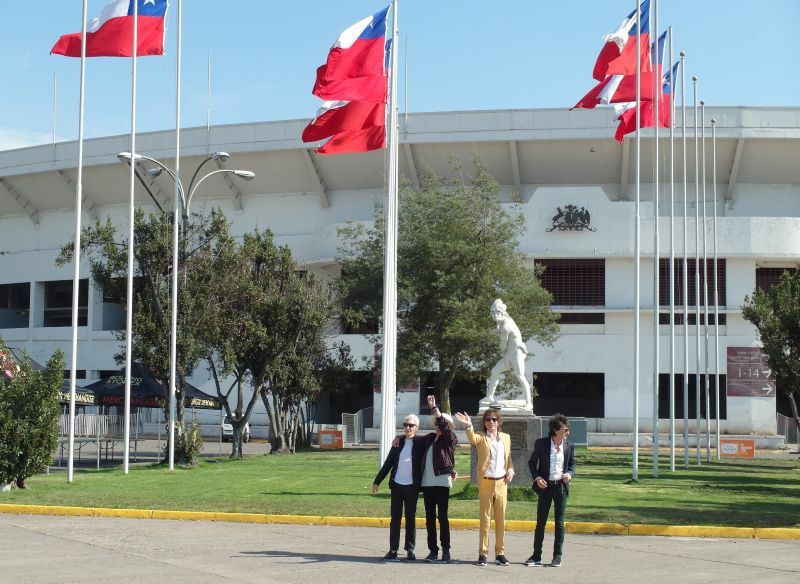 They were posing for the press and the fans in front of Estadio Nacional in Santiago de Chile. This was the same venue they performed at in 1995. Twentyone year later they were back. The day before, in the morning of Sunday January 31, they had arrived from Los Angeles, California, USA, where they have been rehearsing for two weeks. It was shortly after 5pm, the sun was hot and getting lower. Two cars are appearing slowly towards the waiting press and fans. The press has been lined up properly, this is a properly staged photo session. We are in front of the stadium, with the flags of Chile waving in the breeze this afternoon. The car doors open. Charlie Watts and Ronnie Wood in one car. Mick Jagger and Keith Richards in the other car. They walk slowly towards the press and the fans, waving, smiling, wearing sunglasses. Then they are in front of the flags. Posing. Smiling. Taking a few steps forward. The fans are behind the fence singing Olé Olé Olé as loud as they can. The photo crews have perfect conditions and do their work. Then The Rolling Stones say thank you and goodbye. The cars are gone. Smiles on the faces of the fans. Even some in the press are just as much fans as press today. When The Rolling Stones are present time stand still. It feels like a long time but the session took less than tree minutes. But this was just the first part today for the real fans. Some left, but many stayed. Half an hour later we could hear music from the stadium. 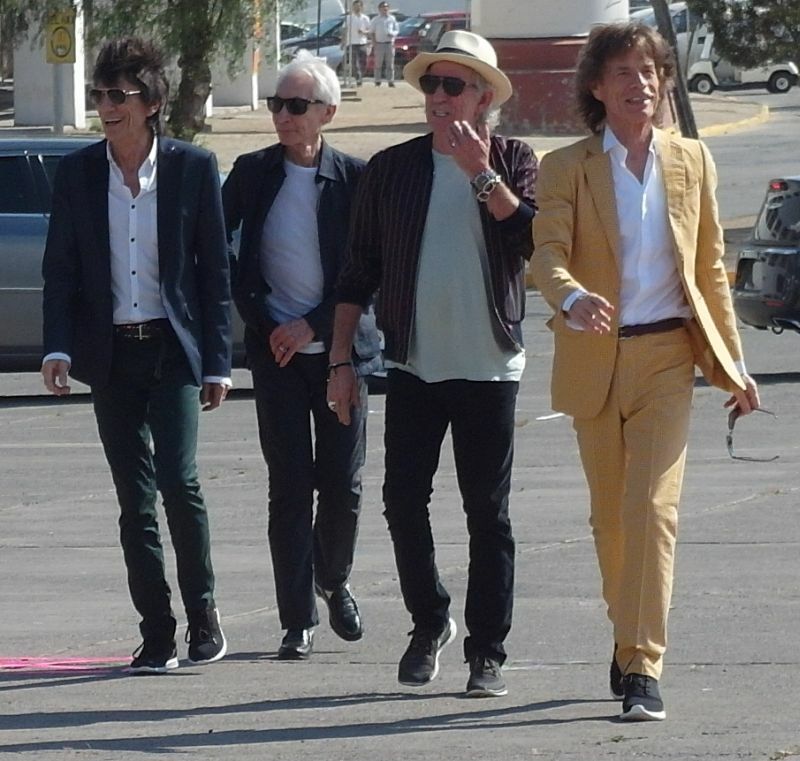 The Rolling Stones were to do a soundcheck, and also a rehearsals session. First they did a blues with a touch of Chuck Berry riffs. Then they did the Toots and The Maytals cover song "Pressure Drop". A great reggae feel to it. For two hours we could hear loud and clear what would probably a part of the show in Chile on Wednesday. Ronnie did just some brief guitar riffs from "Dead Flowers", some seconds only. Then they did "Tumbling Dice". Then "Like A Rolling Stone". Then two takes of "She's A Rainbow". Followed by two takes of "Anybody Seen My Baby". Bernard is rapping the names of cities in Chile, which will be a crowd pleaser for sure. Still a lot more to go... We get "Paint It Black", just a short bit. Then "Gimme Shelter", with the new voice of Sasha Allen. Then "Out Of Control", followed by "Wild Horses" and "Sympathy For The Devil". Keith Richards is on. He does a magnificent version of "Can't Be Seen", then "You Got The Silver". The question is now... Did Mick leave? Not really. We hear the famous harmonica by Mick doing the "Midnight Rambler" intro, but nothing more. It was the ten seconds version, but it was great. We also got Matt Clifford doing the horn solo of the intro to "You Can't Always Get What You Want". Nothing more. Just the horn. But it was long and beautiful. Two hours of The Rolling Stones live in Chile. 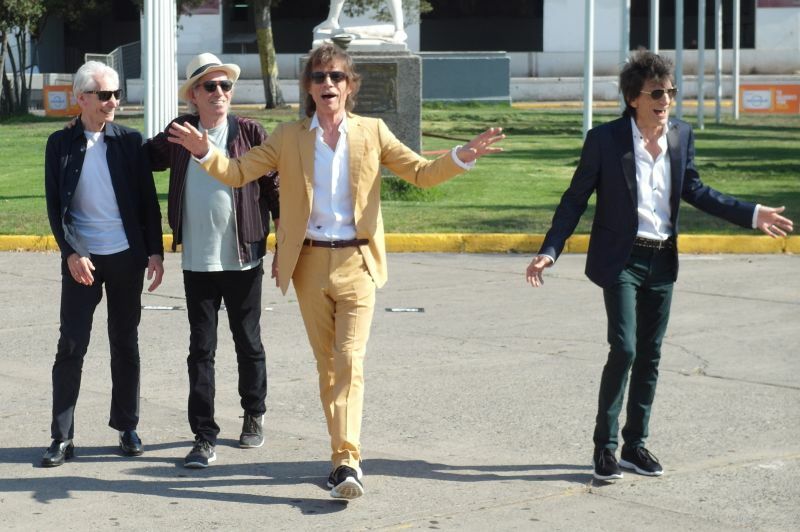 I asked one of the fans next to us if he had seen the Stones last time they played live in Chile. "No" he said, «I was just one year old then». Now he and his buddies are 21-22 years old. 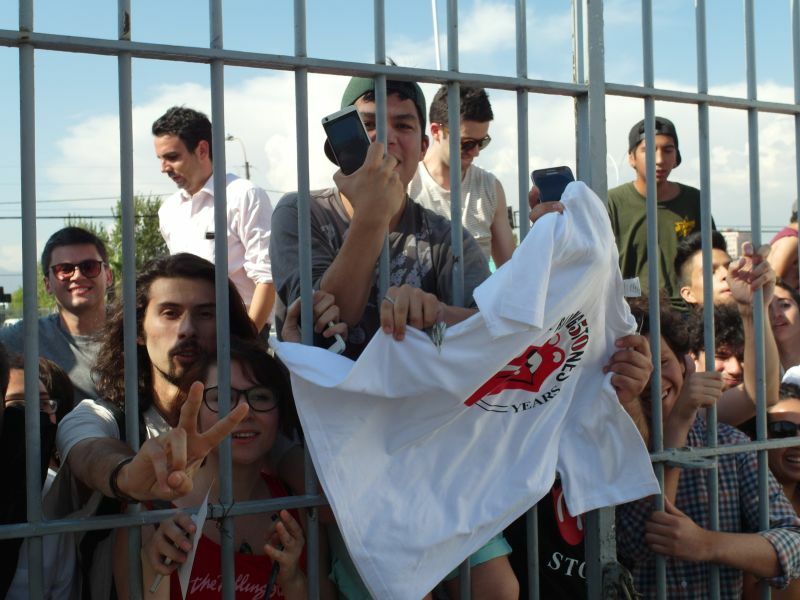 That is the age of many Stones fans in Chile as it seems. Many in the 20's and 30's. A young crowd. Everybody is ready for the real show on Wednesday February 3.